It is thought the Great Dane was originally bred in Germany for the purpose of assisting Europeans to hunt wild boar, a very savage game animal. They were also used as estate guard dogs and companion animals on large estates. The Great Dane should be a strong athletic dog. Even though our Danes aren't used as hunting dogs, they should still be built with proper structure to live strong athletic healthy comfortable lives. Great Danes have incredibly fast growth rates, they are susceptible to fast growth health issues, some can be life threatening and can permanently cripple them. For responsible breeders, breeding bigger Danes isn't a goal, they are big enough as they are. Great Danes are a breed that the males should appear more masculine than the females, with a larger frame and heavier bone. Great Danes should be dogs of substance. Well bred healthy Great Danes don't look like tall Greyhounds. The shoulder area is called the forequarters and the shoulder blade must be strong and sloping, forming, as near as possible, a right angle with the upper arm. The structure of the front shoulder is important because it forms the front suspension system for the dog acting as a sort of shock absorber for the front shoulder. Proper structure helps our Danes live comfortable lives into old age. The elbow should be one-half the distance from the withers to the ground. The chest should extend down to the elbow. These are the characteristics that make a Great Dane look like a Great Dane. The Great Dane has withers (top of the shoulder) that shall slope smoothly into a short level back with a broad loin, ending with hindquarters that shall be strong, broad, muscular and well angulated. Having properly built and muscular hindquarters allows our Danes to jump and play, living the athletic life they were meant to lead. Well educated, responsible Great Dane breeders understand how important proper structure is to our Danes leading a long comfortable athletic life. Who is responsible for the written description of the Great Dane? In the United States, the Great Dane Club of America is the caretaker of the written description of what a Great Dane looks like. It is important that breeders of Great Danes are very familiar with the written standard. If they are not, they can end up breeding Great Danes that look like tall Greyhounds or heavy Mastiffs. 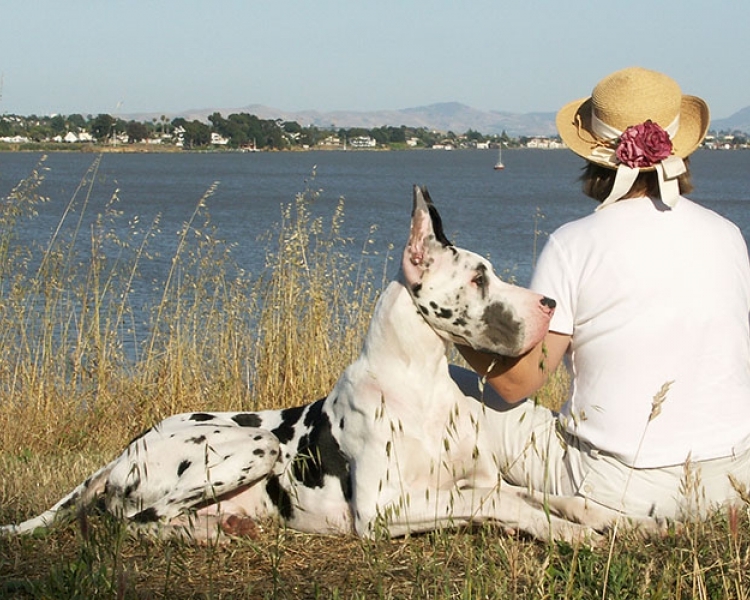 What makes a Great Dane isn't only an AKC pedigree with the breed listed as Great Dane. With an uneducated breeding program, a breeder can morph a Great Dane into a lab. What makes a Great Dane a Great Dane is what it looks like (its breed type) IN ADDITION to an AKC pedigree. 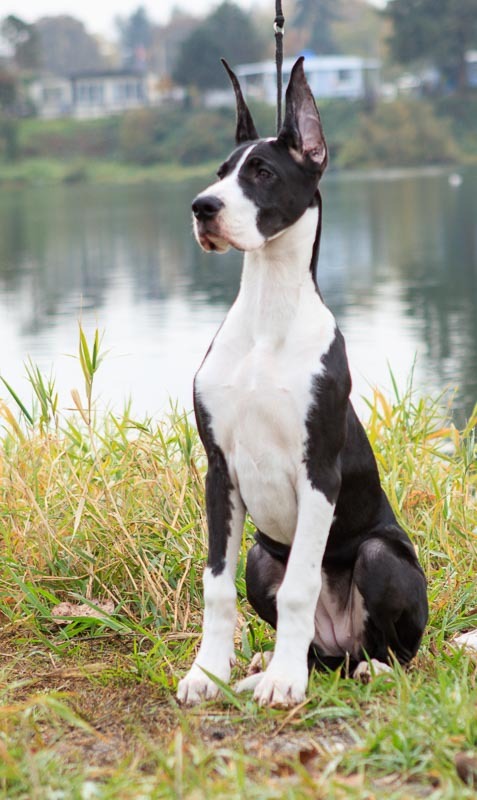 The Great Dane Club of America maintains two documents that describe what a Great Dane should look like, the Great Dane Standard and the Great Dane Illustrated Standard. Here is a link to the Great Dane standard, the Great Dane Standard. It is a text only description and for the beginner, the illustrated Standard is probably a better document to study. Here is a link to the illustrated standard, the the Illustrated Standard. For someone first learning about Great Danes, the illustrated standard includes drawings and more detailed explanations.